The ride Elise and VIncent’s Walpack Inn wedding took us deep into New Jersey’s Sussex County, through winding roads and lush green forest. 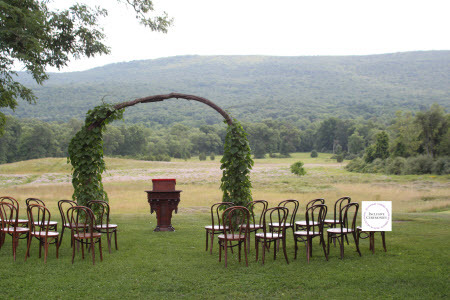 When we arrived, I was treated to one of the most amazing backdrops I’d ever had for a wedding ceremony. 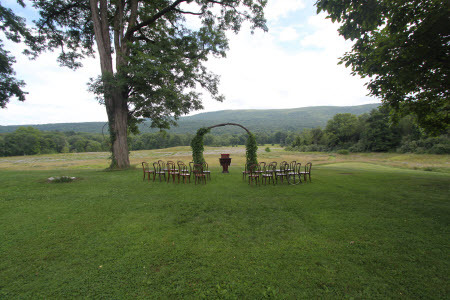 The staff at the Walpack Inn was friendly, attentive and quick to put out extra chairs when I asked them to. Elise and Vincent found me through Elise’s friend (and fellow musician) Annelie. Annelie provided the music for another wedding I did some time back–though we can’t remember which. As she said, she must have liked the ceremony because she kept my card! 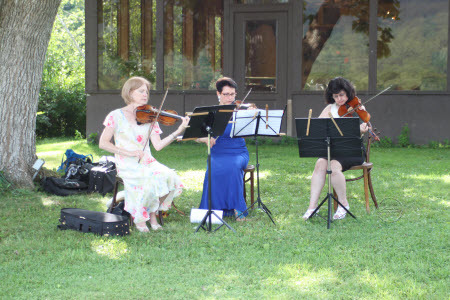 That’s Annelie on the left welcoming everyone to this Walpack Inn wedding with music! And here’s Elise and Vincent! 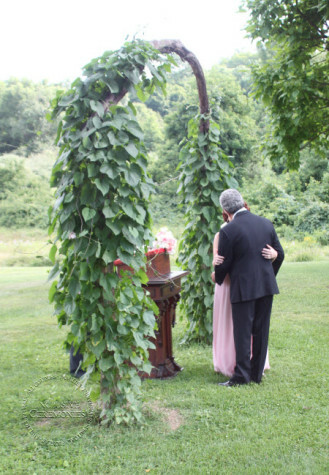 Elise and Vincent wanted a lighthearted ceremony that celebrated their 10 years together. 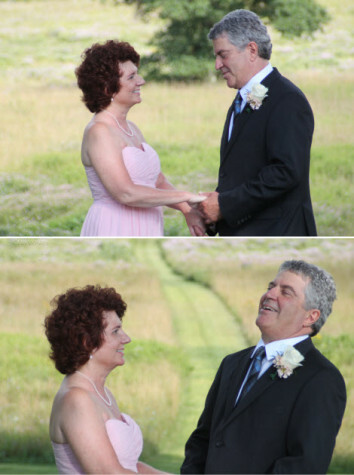 They wanted their guests to laugh, to feel a part of the ceremony as well. Here’s how we did it. Processional—Enter Elise and Vincent together. 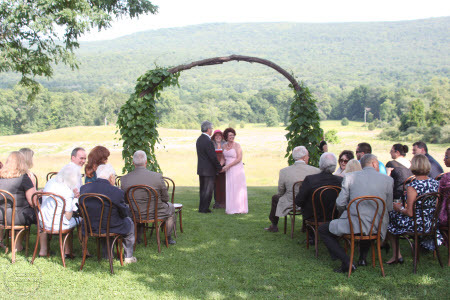 Rather than having just one or two guests come up for the readings, Elise and Vincent liked the idea of having everyone be a part of their wedding ceremony. So we began by asking everyone to greet each other. This is a fun way to get everyone involved and relaxed at the beginning of the wedding ceremony. 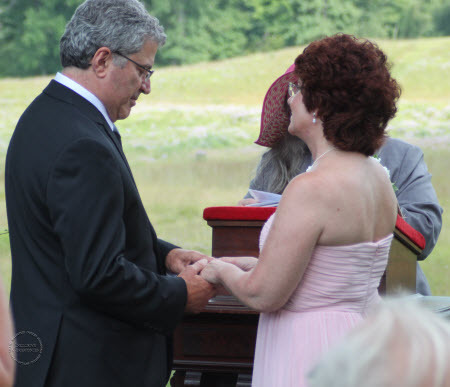 We began the ceremony by having guests greet each other. Vincent and Elise wanted custom vows written for them, but they didn’t want to read or repeat, so we did them in the traditional “I do” format, while still using words that honored their own experience, love, and goals for their marriage. A Wallpack Inn Wedding Surprise: Wild Turkeys! At one point during the wedding ceremony, Elise looked over my shoulder in surprise! 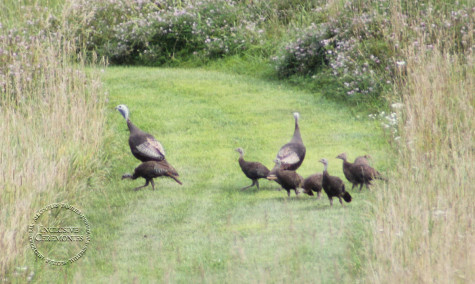 We all turned to see a processional of wild turkeys making their way across one of the mown paths in the wildflower strewn field behind us. There are some who would consider this a very auspicious sign and even a blessing, as turkeys are a symbol of abundance and there were a lot of turkeys! Wild turkeys graced the wedding ceremony. After Elise and Vincent exchanged rings—and after the turkeys—we turned once more to their family and friends and asked for them to promise their continued support for Vincent and Elise. Then we closed with a poem that expressed our heartfelt wishes for our happy couple, Bond of Love by Angela M. Maynard. Here’s what Elise had to say about the ceremony. 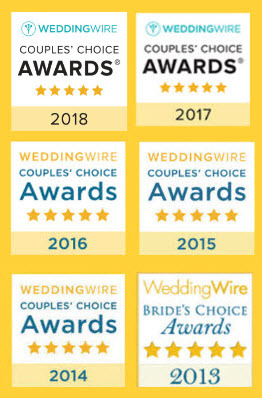 For future couples who wish a truly unique and wonderful service, I would high recommend Cris Kollett and her services. She was so very helpful, kind and pleasant to speak with right from the very first meeting. She has no trouble helping with any details or adjusting her schedule to meet any questions/issues. I felt completely confident from the very first. 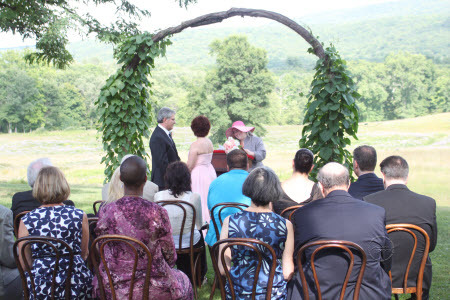 Our wedding was at the Walpack Inn in Walpack Center NJ, a wonderful restaurant with fantastic views of the countryside, not to mention the wildlife! Cris’s delivery of the service was superb and made everything special. Even our guests loved her! 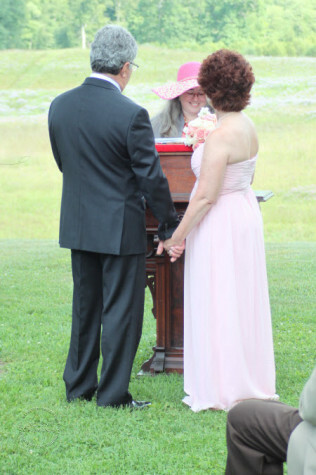 She helped us put together our ceremony with engaging questions that were never too abrupt or too personal. Her handling of everything was exemplary. I would love to do another Wallpack Inn Wedding. 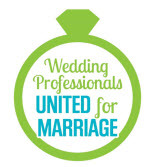 If you’re getting married at the Wallpack Inn or anywhere else in the New Jersey, New York area contact me today! 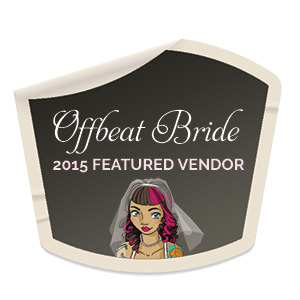 If you’re looking for musicians for your wedding, you can reach Annalie at afvln@yahoo.com.